All packed into a slim, beautifully curved case that fits in your pocket, The Cotman Brush Pen Set allows you to capture moments of inspiration no matter where you are, and add splashes of vibrant colour to your work with all the precision and control of your favourite brush. 12 Cotman Watercolour Half Pans made from the purest pigments in the following colours: Payne's Grey, Lamp Black, Chinese White, Lemon Yellow Hue, Alizarin Crimson Hue, Ultramarine, Burnt Sienna, Yellow Ochre, Sap Green, Viridian Hue, Turquoise, Dioxazine Violet. The brush pen was developed especially for the set, it has an ergonomic design and its own water reservoir. The tactile bobble makes the brush pen easy to squeeze and control the flow of water to the brush tip when you need it. 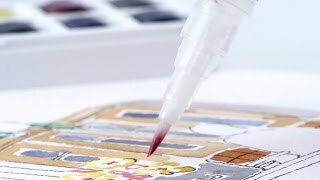 From a practical point of view, the brush pens clear, transparent design means that the water level is always visible. The load, spring and point of the beautifully fine synthetic tip gives you all the feeling, control and line versatility of a traditional brush. As it has a built-in water source, there is no need to carry around a water container. The brush tip is made of synthetic strands that form a fine tip for detailed line work. The brush pen has an impressive brush load and great spring. Like all brushes, the brush pen will last for years if it is cleaned after use - gently squeeze the barrel to deliver water via the tip to clean the tip and pat dry. From time to time it’s worth pulling apart the 3 component parts to rinse each section under warm water. To clean the brush tip while painting, gently squeeze the barrel to deliver water via the tip to clean the tip and pat dry. The brush is only designed to be used with water, using ink inside the pen will stain the water reservoir. It isn't recommended that you carry the pen filled with water around with you just in case it leaks.